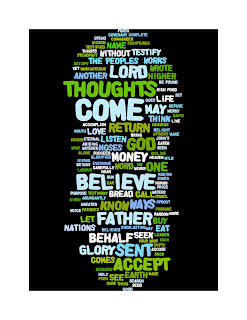 Rectory Musings: The Word as a Wordle is back! 1. Find a quiet place, pray, and ask God to help you to understand what it is you are reading and to speak to you through it. 4. Read the passage again quietly to yourself and underline key words or phrases that stand out to you. 6. This reflecting or meditating should lead to a response in us, in prayer. The highlighted words and the connexions we have made should give rise to confession, a cry of gratitude, lament, relief or praise in us. 7. The final stage in this process is obeying or applying what we have read and prayed. How will it affect our choices and lives this day? Thanks for the sermon, the umbrella very poignant for me personally. reminded me of an illustration i have seen where the person has a jug of water that keeps on pouring into the vessel, the water is God's love and life, the vessel me or you. Then the person puts a plate over the vessel causing the water to spill everywhere, the plate being what ever at the time prevents us from receiving the love and life of God. It was quite a powerful illustration particularly that the person doing it had no regard for the electrically powered amplification system that he was using right next to him!